Another day, another report with evidence that corporation tax cuts, or tax cuts more generally, don't lead to economic growth. Indeed, this is our second blog today on this subject. The latest report comes from the Center for Effective Government in the United States. 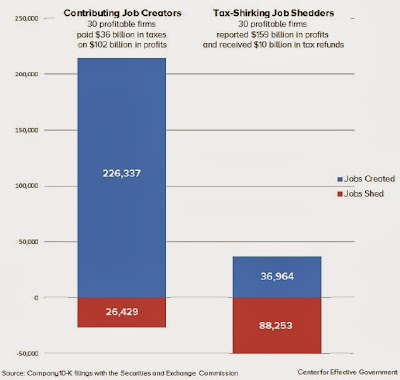 This is certainly consistent with, though it does not of course prove, the idea that companies that seek to reward shareholders by rent-seeking -- of which corporate tax avoidance is one obvious form -- are less likely to create genuine economic value and to create jobs than those whose managers are more interested in building genuine long-term economic value, who don't waste their time trying to figure out sneaky tax shenanigans. "In 2004, when a temporary “tax holiday” on offshore profits was put in place, 58 firms brought $218 billion in profits back to the U.S. under the program, for a savings of $64 billion on their taxes. In the following two years, those 58 firms eliminated 600,000 jobs." That notorious tax giveaway was, of course, billed as a job-creation measure. "One of the arguments made by big companies in favor of making their low payments even lower is that they’d go out and create more jobs. This is clearly spurious. Large companies are already awash with cash, thanks in no small measure to taking advantage of the Fed’s largesse and issuing bonds. They could invest and create jobs with the dough they already have if they were so inclined." "Corporate taxes transfer money away from a sector (corporations) that lets it sit idle, into the hands of a sector (government) that puts it straight to work – educating children, building roads and so on. Corporation taxes and appropriate spending are exactly what Britain needs right now." And so on. But the message doesn't seem to be getting through. The tax-cut obsessives remain out in force.